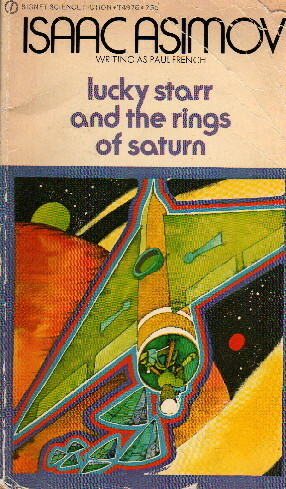 The twin rings of Saturn were suddenly swarming with the robot ships of the deadly Sirian enemy. The avowed antagonists of Earth, they had crossed 50 trillion miles of space to provoke a war which they knew they could not lose…for the awesome forces of earth dared not rally against the invaders. Only Lucky Starr, of Earth’s Council of Science, had a chance to avert the impending galactic holocaust. But one slip-up in his daring plan would mean certain death…and a place in history as Earth’s most infamous traitor! This is the last of the Lucky Starr books. Asimov had intended at one point to write more, but other projects intervened and eventually he abandoned the idea. It’s just as well. The space opera genre is not Asimov’s forte. Even within the Lucky Starr series, Asimov’s strengths are not the action-packed fisticuffs but the clever plot twists and reversals. Here, for example, he sets Lucky Starr up to behave traitorously and then at the last minute reveals how Lucky has managed to trap the dreaded Sirians and win the day. 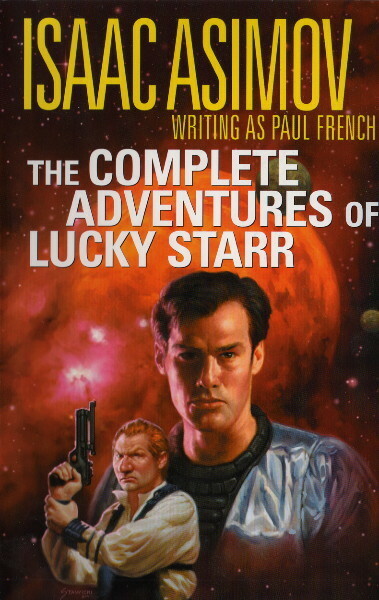 This book has, in fact, the most intricate plot of the Lucky Starr books. It also has distinct echoes of the Elijah Bailey novels—a crowded Earth, fifty former colonies who have bred themselves into superiority and want no more Earthmen to join them (whom they think of as inherently inferior), the Outer Worlds antagonistic towards their mother world, the Outer Worlds far more heavily roboticized, and so on. Plus, of course, the specific manipulations of the positronic robots in the book (long since a dead giveaway as to who "Paul French" was) remind one distinctly of The Naked Sun. Still, I cannot say that this is my favorite Lucky Starr book. In fact, it is perhaps my least favorite. This is odd because it is more mature and sophisticated than the other five—it may be because of the extended flashback dominating the first few chapters or the apparent treason of Lucky Starr. On the other hand, I did enjoy it more with this most recent reading than I had expected, so perhaps it isn’t my least favorite, after all. One last note about the series as a whole. The Lucky Starr books are definitely unique within Asimov’s fiction in showing an extended look at a human-colonized Solar System. Asimov tends to have two venues within which he sets his stories: the Galaxy, and the Earth. Never (well, hardly ever) does he tell a tale within the Solar System as his background; the Lucky Starr books are the most extended exception. This is rather a shame, because the books do have an interesting background, and Asimov does write well against the Solar System backdrop. My objections to the series have nothing to do with this—which I consider one of its main strengths—but are more directed to its orientation towards fisticuffs and fighting, which I do not find particularly interesting.